Master Oh Waily was 3 months old last Tuesday. How the time has flown past. Miss O at three months was honoured by a blog post in pictures which can be seen here by way of comparison. Master O will have his own photo montage below – continue to scroll at your leisure. And here is Miss O’s nearly three month old report card. As you would expect, Master O shares some things in common with his sister, yet remains defiantly individualistic in many others. As for the little Master, we went for our three month visit to the Plunket nurse this morning and had our usual array of weighing, measuring, prodding and poking and here are the results of that. This means his length is still tracking along the 85th percentile of the WHO growth charts for boys, while his weight has caught up and is now also back tracking on the same line after a small dip. His head, however, continues to defy all reason and tracks above the 97th percentile. Yep, the boy has a big head. Hopefully it is full of brains. As for what the little man is up to in his daily life, since October he has been displaying the usual marathoning traits of his age group. He goes for regular horizontal jogs, sometimes so vigorously it could be thought that he was, in fact, training for the long jump. He happily smiles and grins when he sees a face or hears a voice that he recognises. He continually grins when the little Miss leans over to give him a kiss. Personally I think he identifies her as “the blonde blur that gives me those squelchy kissy things on my cheek”. He can’t possibly have enough focus time for the speed at which these little pecks are delivered at and then retreated from, never mind the fact that the slow kisses involve being millimetres away from his nose and eyes. Even I couldn’t focus clearly on someone that close to my face. We still have a flat patch at the back right of our head, which is slowly coming right. It will take growth and yet more visits to the osteopath to encourage the bones to realign themselves. Apparently it is a fairly common occurrence, and has little or nothing to do with the sleep positions you put them in. Based on the first few visits, I can vouch for cranial osteopathy (i.e. 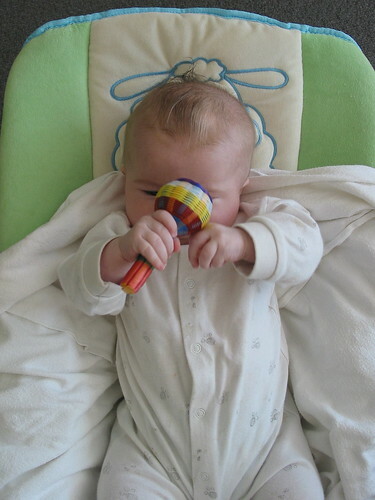 no crunching or manipulations) loosening up stiff necks and making babies a lot freer in their movements. Now we are in the loosening up of the lower back, which tweeks to compensate for the cricked neck and head. Nothing like a knock-on effect to keep your parents forking out the cash for running repairs. 1. Find a good one. Use referrals. Here in Auckland the clinic to go to is Stillpoint. 2. I have been told, in the past, that baby’s sleep difficulties can also be relieved by osteopaths. 3. They don’t crunch, and it looks like all they are doing is holding the baby’s head and neck, but don’t be fooled it does actually do things. I’ve had it done before and you can feel subtle, gentle pressure but nothing painful or uncomfortable. Master O is now fascinated by his hands, mostly his right one. He spends quite a bit of time examining it every awake time. 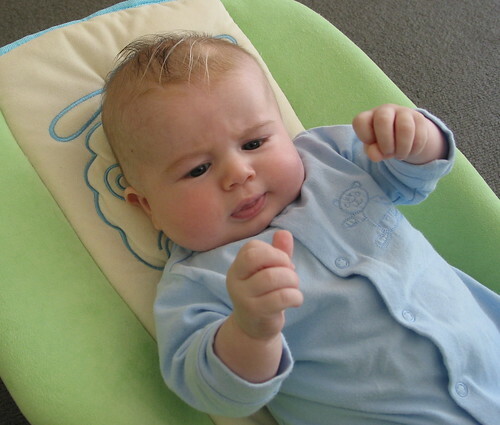 He is also slowly getting to grips, pardon the pun, with opening and closing his fists. He has discovered the joy of blowing bubbles and making raspberry noises. This naturally leads to poking your tongue out at all sorts of weird and wonderful angles. I would definitely categorize him as having a “thinkers tongue”, it moves with his thoughts and his efforts. Master O also “shouts” along the same lines as his sister did. Some of his versions of shouting sound remarkably cat like. If I didn’t know better I’d say he demonstrated an evolution of man from cat. He doesn’t cry very often and when he does it is usually due to some frustration or internal gas bubble that just doesn’t want to move. He sleeps well, most of the time. Daytime still produces one or two hour sleeps at the most. After his bath and last meal of the night between 7:30 and 8:30pm we are able to sleep through until 4:30am most nights. We still get the odd 2am waking, and since we are theoretically about to hit the three month growth spurt, I am just waiting to see what that does for his sleeping and eating patterns. I’m keeping my fingers crossed for the night sleep staying the same or lengthening out an hour or two. As of yesterday Master O has shown the beginnings of learning to roll over. He began twisting his neck in an attempt to look over his shoulder (while lying on his mat on the floor) and began to arch his back. He did this vigorously at each afternoon awake time. So we are now on the path to mobility. I imagine I will be reporting on his success in about four to six weeks time. So that covers most things going on with the little Master. Here are some more recent photographs. There are even one or two humorous ones with his sister on my Flickr stream should you wish to see sibling interaction at it’s funny points. And, finally, I have joined Circle of Mums through Facebook. If anyone is interested in connecting up that way, just drop me an email and I will send through the links to the kids’ pages.